A Limited Edition fine art print by Peter Deighan. A celebration of the great drivers of the past and present. 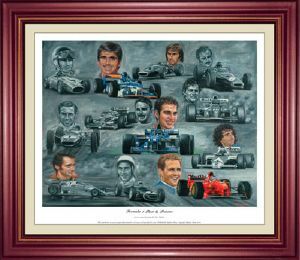 A must for all motor racing fans, included here amongst others are; Jackie Stewart, Graham Hill, Jacques Villeneuve, Alan Prost and Stirling Moss. Published in a single limited edition of 500 worldwide, each image measures 483mm x 400mm and has been numbered and signed by the artist. Please note, our price is for the unframed, limited edition print.